His speech was replete with intellectual justifications predicated on the inherent internationalism of the ideology of socialism and of taking the fight to the avowed enemy of fascism. He presented legal justifications first through United Nations Resolution 2249, paragraph 5 which calls upon member states to take all necessary measures to redouble and co-ordinate their efforts to prevent and suppress terrorist acts committed specifically by ISIL and to eradicate the safe haven they have established over significant parts of Iraq and Syria, and secondly, on the grounds of national self-defence via Article 51 of the UN Charter which enable nation states to engage in self-defence, including collective self-defence, against armed attack. 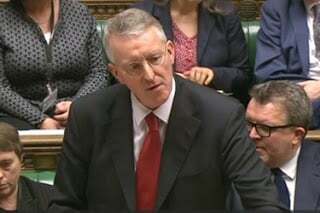 Benn’s rationale about focussing on the threat provided by the Islamic State as a group of “fascists” is flawed. He is seriously ill-informed if he is not aware that the 70,000 or so rebels mislabeled as ‘moderate’, including the aforementioned al Nusra Front, are guided by the same form of ideology. He surely must have heard of the admission by a senior US general about the “four or five” US-trained moderate rebels who represent the sum total of a 500 million dollar programme. The Islamic State cannot be defeated if Turkey, a member of the North Atlantic Treaty Organisation, is allowed to continue allowing Islamic State insurgents to traverse its border at will. The border is used to transport illicitly acquired Syrian and Iraqi oil to Turkey where it is then traded at knock down prices for arms and ammunition. Paragraph 5 does not contain the first two features but has third –“all necessary measures.” The conclusion by Akande and Milanovic is that that the paragraph does not intend to serve as the stand-alone authorisation for the use of force against Islamic State in Syria and Iraq. It is Cameron who after all suggested that those whom he termed as “non-violent extremists” including persons who question and contradict official government narratives on events such as 9/11 should be designated as threats to society every bit as dangerous as threat posed by members of Islamic State. Cameron’s choice of words are also ironic given that fact that an Old Bailey case involving an accusation of “participating in terrorist activities in Syria” in the middle of 2015 against one Bherlin Gildon, collapsed because a trial would have revealed embarrassing information about British security and intelligence service support for so-called rebel groups including the supply of weapons and ammunition. It has for long been Israeli geo-strategic policy to balkanise the Arab nations particularly those such as Iraq and Syria which were led by strong military governments with nationalist ideologies in order to maintain its regional hegemony. It is also the policy of the United States to achieve a reorganising of national borders as part of a strategy for securing the energy resources of the region. It is clear that NATO powers such as France and Britain, sensing the possible pacification of Syria by a concerted effort by the Russian Federation along with the Syrian government have taken the opportunity to involve themselves more directly in Syria in an attempt to place themselves into a position where they may be able to effect the goal of removing Assad and effecting the desired geo-political objective of Israel and the United States: the division of Syria. Benn emoted over socialist and other political Left support for the lost cause of the Spanish Republican coalition against General Franco’s military rebellion comprised of a coalition of nationalists. He fails to grasp that action against Islamic State will prove futile given the present circumstances dictated by the United States.